ESC Local 20, along with all our brothers and sisters in the labor movement, is disappointed and outraged to learn of today’s Supreme Court decision. This decision reverses more than 40 years of settled law that has improved the lives of countless working families. The Janus decision is a victory for those who seek to weaken worker protections, lessen the security of our union families, and starve public services but one that will not break us. Despite this decision, we know that our union is strong. We will stand together and continue to fight for all the gains we have won through ESC Local 20: wage and job protections, good health care for ourselves and our families, and dignified retirements. Further, we will stand together and fight for our ability to do the best we can in our professional practices and for the members of the public whom we serve everyday. Today, we recommit not only to sustaining the labor movement, but to building and strengthening it so even more working people can negotiate a fair deal in return for their hard work. Despite this decision, California’s unions will continue to lead the fight for a balanced economy that provides opportunity for all, not just the wealthy and powerful. GO EXTRA! 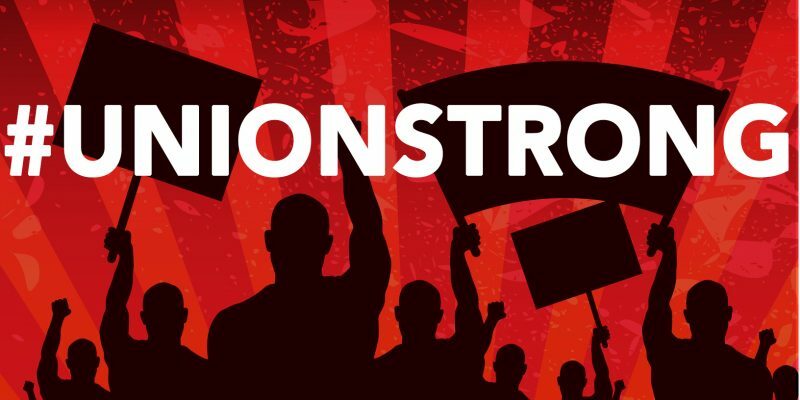 ADD A #UNIONSTRONG GRAPHIC TO YOUR PROFILE PICS ON SOCIAL MEDIA. Q. What does today’s Supreme Court decision mean? The Janus decision today, in a bitterly-divided 5-4 opinion, has reversed 40 years of settled law to determine that fair share service fees for non-members of public sector unions are “unconstitutional.” This outcome is the result of decades of attacks on unions, especially those in the public sector. Today’s decision does not directly and immediately impact those ESC Local 20 professionals working in the private sector. Q. What does this mean for ESC Local 20? ESC Local 20 maintains a very high level of membership in our Local. Our union contracts have been in place for many years to protect us as professional workers and to protect our wages and benefits. We have the pay, benefits, and professional status that our contract secures because we stood together to negotiate them. Member engagement in the Union is what makes us strong in dealing with our employers and that is not going to change with the Janus decision. Q. What is the “union difference”? Strong unions make a difference in your pay, your benefits, and your job security — studies show that all are much improved in comparison to workers who do not yet have a union. There is power in numbers. Q. What will happen in the future? No court decision or politician can stop us from standing together in a strong union to negotiate a fair return on our hard work. That is our right and it cannot be taken away. Reaffirm your commitment to stand with your co-workers to protect your pay and your voice on the job. If you are active in the Union, get more active! Everyone who is part of our union must understand the importance of being a member. Full membership not only makes us stronger but also means that you have the right to approve all contracts, stand for union office, and vote in all union elections. Whenever you can, tell everyone how being part of a union and having a good union contract has made a difference in your life. Q. Do my union dues go to politicians? No, your dues money is not used for any political contributions. Dues are spent on building member power: bargaining wages and benefits, representing members, enforcing the contract, trainings, communications, and organizing. We have a separate political fund that supports candidates who support workers. Some members voluntarily make a separate contribution to our political action fund, and determine where that money goes and who gets endorsed.